Drain and rinse chickpeas and place in a large bowl. Add spices to a small bowl and mix well. Add olive oil to chickpeas and toss to coat. Sprinkle with seasoning and mix well. Place on a baking sheet and roast for 20 minutes stirring once. Meanwhile, chop kale and caesar salad. Make dressing by adding all ingredients to a blender and blending until incorporated. Add water if too thick. Add dressing to chopped salad and mix well. 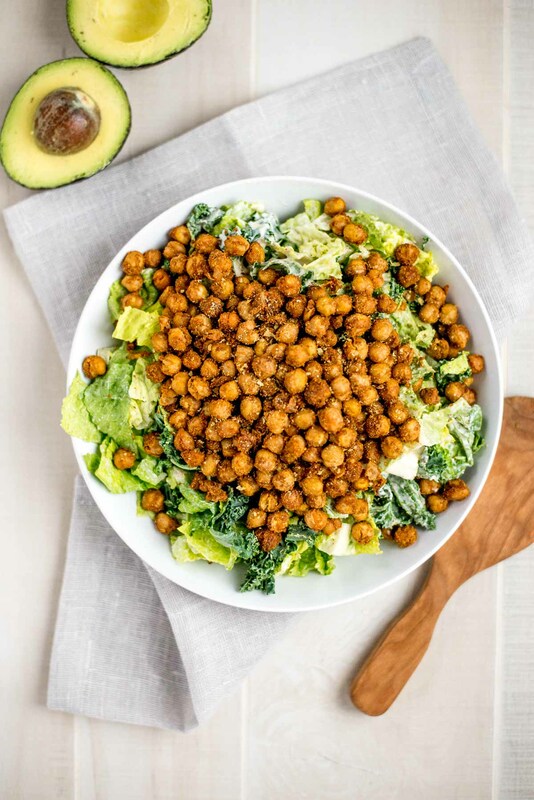 Top with chickpeas and additional toppings.